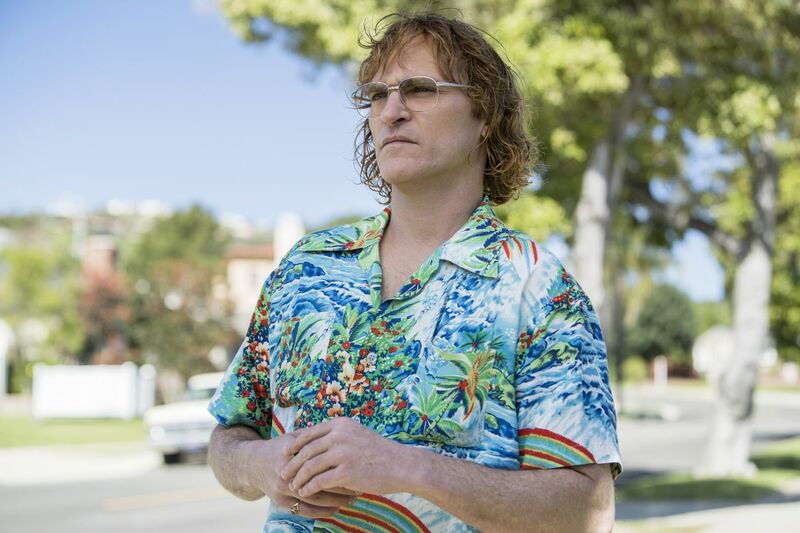 Joaquin Phoenix in a scene from 'Don't Worry, He Won't Get Far On Foot. Hard to believe, but it's been nearly 30 years (!) since Gus Van Sant made Drugstore Cowboy, still one of the most definitive big-screen accounts of drug addiction. The movie was an informed insider's account (based on then-unpublished novel by reformed addict James Fogle) of the way addicts organize their entire lives around addiction, creating a complex structure of rules, superstitions, and priorities. Through Fogle's source material, the movie found a way of describing the life of addict that was empathetic and poetic, but in no way romanticized. It ends just as the title character (played by Matt Dillon) makes a decision to go clean. What might that journey to recovery have looked like? We get a clue in Don't Worry, He Won't Get Far on Foot, which can be looked at as Van Sant's belated bookend to Drugstore Cowboy. It's also drawn from life, in this case the life of John Callahan (Joaquin Phoenix), an alcoholic who in recovery turned to art, and found his purpose and calling as a cartoonist, whose work exhibited an irreverent tone reflected in the movie's title — Callahan was a quadriplegic. His disability was a consequence of his alcoholism — as a young man, he went on a bender with another drunk (Jack Black) and ended up in a car accident that left him with only partial use of his arms. This event is visited in flashback — part of the movie's complex but lucid structure, which looks in on Callahan at various points in his adult life. The effect of this is to focus the story on his recovery, yet we learn a good deal about the physical and economic realities of his paralysis, in unsentimental and often comic terms. Callahan appears to have modified his motorized wheelchair so that it travels at high speed — a metaphor for the full-throttle, confident way he moves through life. He likes to go his own way, at his own pace, which makes recovery a particular problem. Its structure and its rules are an obstacle for the strong-willed Callahan, although he's lucky to find a support group whose regulars who are just as headstrong and insult-proof — led by a hippie rich kid (Jonah Hill, effectively against type). They help Callahan get past self-deception and self-pity that contribute to his drinking and his relapses, and although these are standard elements of recovery movies, they are made newly resonant here by the cast — Phoenix and Hill, but also rocker/actors Beth Ditto and Kim Gordon in small but effective turns as women who lost previous lives to addiction. Philly-bred Mark Webber also registers strongly in these scenes. Callahan has his greatest difficulty surrendering to the "higher power" provisions of 12-step programs, yielding nicely scripted conversations between Callahan and Hill's character that become a strength of the film — we arrive at a spiritual understanding between the two men, ineffable but strong. As Callahan makes amends, Black returns for a cathartic sequence. The cast is uniformly fine, although Rooney Mara is stuck playing a composite of various women that feels, well, like a composite of various women. Directed by Gus Van Sant. With Joaquin Phoenix, Jonah Hill, Rooney Mara and Jack Black. Distributed by Amazon Studios. Running time: 1 hour, 53 mins.